New Australian research suggests some animals carefully measure the intensity of light during twilight to know when it's safe to come out and forage. Biologist Ajay Narendra and colleagues of the Australian National University reported their study of twilight-active Australian bull ants in the Proceedings of the Royal Society B. "The ants need to optimize the trade-off between the risk of being seen by a predator and the need to see where they are going," said Narendra. Narendra said previous research has shown that temperature acts as a trigger for some animals to go out foraging. For example, some animals that are active at night in summer change to being active during the morning in winter. This helps them avoid really cold night temperatures in winter and really hot temperatures during the day in summer, said Narendra. But many animals, including bats, only come out to feed at twilight, and little is known about what determines the timing of their activity. 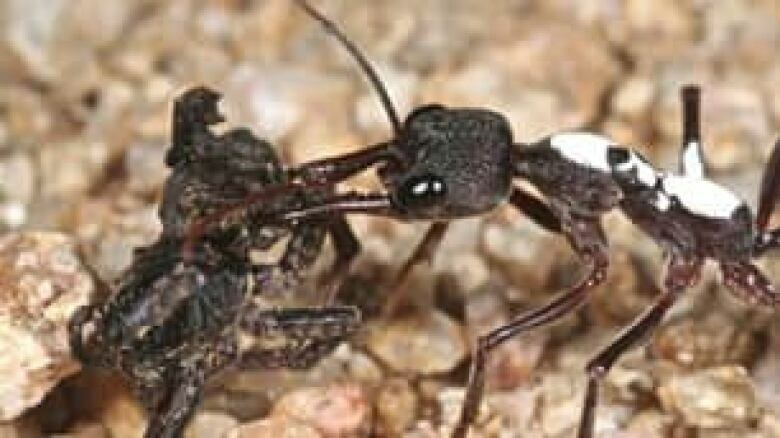 In the first ever study of what triggers twilight activity in animals, Narendra and colleagues carried out a field study of the Australian bull ant (Myrmecia pyriformis). They initially thought that sunset triggered the ants to leave the nest. But in their experiment, they found that ants came out to forage anywhere between zero and 20 minutes after sunset. "If it's extremely cloudy at sunset then the ants will start coming out quite early," said Narendra. "But if it's very bright, with a clear sky, at sunset time, the ants will come out much later," he said. The researchers also ruled out temperature as a trigger. Twilight temperatures at the study site ranged from 30 C in summer to 5 C in winter. "The animals are active within this broad range of temperatures which means the animals are not really looking for a temperature trigger to begin their activity," said Narendra. The final hypothesis explored was whether the animals were using the intensity of light as a trigger for activity. Narendra and colleagues shined a bright lamp on the nests for 45 to 60 minutes during twilight, when activity would usually occur. The light was equivalent to that which would occur an hour and a half before sunset. "They didn't come out until we actually turned the light off. We turned the lights off and immediately there was a big burst of activity," said Narendra. "That shows they are, in a way, monitoring or measuring light intensity to begin activity," he said. When the researchers shaded the nest, making it darker than it would otherwise be at twilight, this did not change the ants' activity. Narendra said the ants have a circadian rhythm, which gets them from deep inside the nest to close to its entrance at around twilight time. Once at the entrance of the nest, where they can see the sky, the ants then make a decision about whether to go out foraging based on the light intensity. So a darker-than-normal twilight will not get them out foraging any earlier because their circadian rhythm will not get them to the nest entrance earlier, said Narendra. Narendra said the ants don't go out in brighter light to avoid bird predators. "They know currawongs and magpies are not going to be around the nest when it gets really dark," he said. But why not come out and forage at night? "That is something that really bothered us for a long time," said Narendra. He said the ants need to be able to see visual landmarks like the silhouette of trees against the backdrop of the sky so they don't get lost. "This visual information starts disappearing once it gets dark," said Narendra. He said the hypothesis now needs to be tested in other twilight-active animals, including bats.